Usually around the 6 month mark, your pediatrician will give you the go-ahead to start your baby on solids. Questions start to swarm your mind: What will be her first food? Should I start with a vegetable or a fruit? What time of day should his first meal be? How will this affect breastfeeding? Starting your baby on solids might seem like a daunting feat but we are here to help! 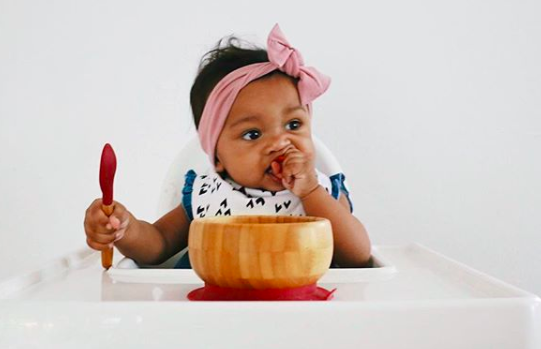 Below are some tips on how to make your weaning journey a successful one! Whether your little one is 5 months, 6 months or 7 months, don’t look at the calendar to tell you when to start the process of starting solids. Instead, watch your baby for signs that he or she is ready. He should be able to sit up without any support and can pick things up with his finger and thumb (also known as the “pincer grasp”). He should also have lost what is called the “tongue thrust reflex” where he automatically pushes food out of his mouth with his tongue. You may also notice that he is interested in the food you are eating and may even mimic your chewing. Often, babies will nurse more frequently or require more formula, showing us that they are still hungry after a feed. These are all signs that your little one is ready to start solids. In the early stages of weaning, your baby’s main nutritional supply will come from breastmilk or formula. Solids are served as a compliment and should be offered just a few bites a day at first and slowly increased depending on your baby. If your baby is not interested in solids, do not be discouraged. Wait a few days and try again. The important thing is to offer them and eventually she will get the hang of it. By the time she is 9-12 months old, she should be having three meals per day which should make up about 25% of her caloric intake. Think of this as about a ½ cup of pureed vegetables at each meal, less if there is meat or fish blended into it. The important thing to remember is that babies have the ability to stop eating when they are full. It is important that we listen to this and follow their lead. What are the best first foods? This depends on what country you are in! In Europe, most babies are started on a vegetable while in the USA, most babies start with iron-fortified cereals and then fruits. Carrots, peas, squash, sweet potatoes, bananas, plums, avocados, pears or apples (cooked to soften) tend to be some favorites. Usually start with one and introduce a new food every few days to a week depending on how baby is doing. Be sure to avoid any strong allergens like nuts and nut products and avoid any seasonings. How do solids fit in with nursing/bottles? If you are breastfeeding and plan to continue doing so, it is recommended that you offer solids about an hour or so after a nursing session. This way baby will get all of his nutrients from the breast milk and eat only what he needs and wants from the solids offered. You will also maintain your supply and be able to stick to your nursing schedule if you had one. The same should be done if baby is formula fed until about 12 months when you can reduce the quantity of milk and increase the caloric intake and nutrients in the food being offered.